I have been baking regularly on weekends, but haven’t had the chance to post a blog. Lately, my parents, whom I bake mostly for have complained that the crusts of my breads were too chewy, and demanded a softer version of my hearth multigrain bread. Butter, and/or enrichments came to mind instantly as these soften the crust and crumb, in addition to the usage of a bread pan instead of baking on hearth which also contributes to bread softness. However, recalling Floyd’s wonderful soft bread using Tang Zhong, I immediately knew that a Tang Zhong (aka: water roux) will bring much softness and tenderness to my multigrain breads without increasing the fat content. Guided by Floyd’ recipe, I limited my Tang Zhong to 5% of total flour weight. It was made with 45 grams of White bread flour, and 225 grams of water. After all ingredients were mixed, the dough was unmanageably wet and would not form coherent dough. I was worried about the effects that Tang Zhong’s might have on my recipe, but I persisted and added slightly more flour. The dough began to come together and was finally manageable, although still wet. Shaped and molded, final proofing took 3-3.5 hours, and was then was baked at 420F for 15 minutes (no steam), and 400F for 20 minutes. The bread was allowed to cool for 2 hours, after which it was sliced and wrapped. 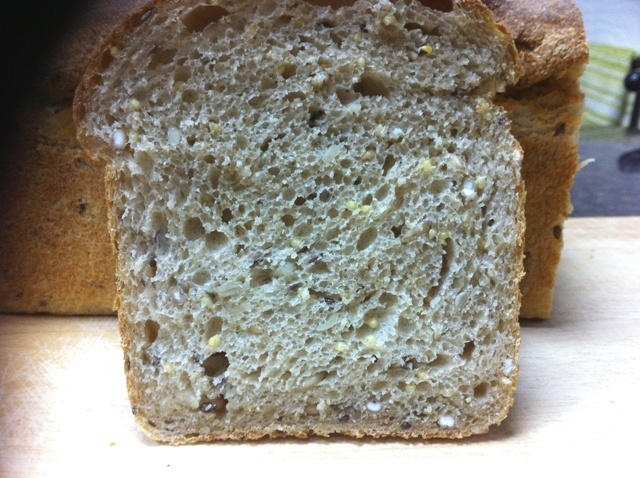 The bread is incredibly soft, tender, moist, and full of grain/seed goodness! Next bake, I’ll reduce the hydration to a reasonable level. 6 baguettes, wow did you baked them all at once? they are excellent. Yes, i've used millet, flaxseeds, sunflower seeds, and barley. 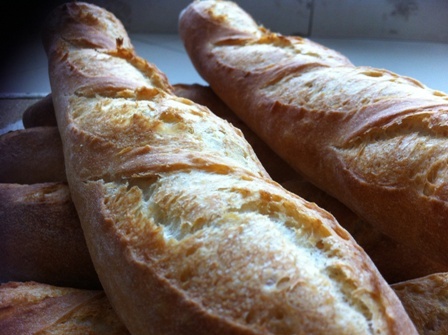 Scaled at 250 grams each, the baguettes were baked on two stones at once. 6 baguettes are the maximum capacity my oven can handle. Very nice Khalid. Looks picture perfect. Or, perfect in the picture! No Picnics nowadays, Ramdan and all, but the breads are resting now in my freezer for occasional sandwiches. Looks like you ended up with a nice soft and tasty bread just like Mama ordered :). I Ike the looks if those baguettes as well. Nice shaping and scoring for sure. How did your crumb and taste come out? The baguettes had an open crumb and a nutty poolish sweet fragrance, and flavor. The crumb wasn't a honeycomb like Txfarmer's but it was decent enough for me. Your baguettes are beautiful. Love the crust color - the variance in the colors where you scored the loaves - really pretty. 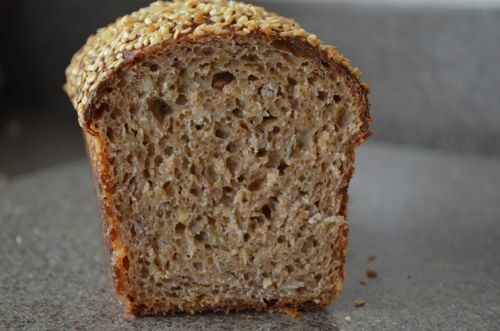 I have been experimenting with HL in my 100% whole grains spurred on by Phil's last post with 100% HL but my quest did begin when Floyd posted his tang-zong loaf too. Sent me back to Syd's Asian Style Pan de Mie which is a very soft loaf but takes 3 days to complete and is high in enrichments....That led me to a custard loaf which uses a bit less fat but it is still there and only takes overnight to complete. 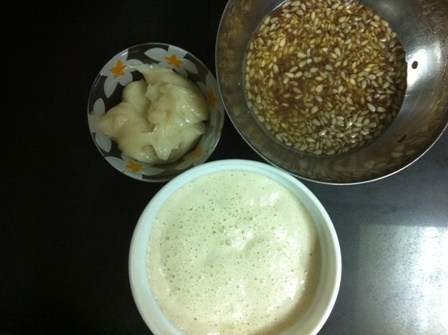 Like you, I don't like to add a lot of fat or sweetner to my loaves so upping the hydration has allowed me to get soft without the fat and I have been able to do it without a tang-zhong so there is a bit less work. Trick to an easier to handle dough though is an overnight bulk retardation time in the refrig. Dough is sticky in the morning but not as sticky as when it has just been mixed. The loaf pan holds it shape like yours did. Today I am baking an oatmeal date loaf with sesame seeds - inspired by you :) and the HL is 110%! That high though due to the oatmeal that does absorb quite a bit of water. The dough was pretty slack this morning but I was able to shape rolls and a loaf with it with much of a sticking problem. I am imagining they will be very soft. There are many ways to achieving a soft crumb, and i wanted to try Tang Zhong. Moreover, WW multigrain by Hamelman is a favorite here, and making it with a Tang Zhong was a natural choice. I like your overnight bulk retardation method, but i'm too tired and busy by the end of the week to mix any dough. I'm watching out for your oats-date bread, it sounds like a winning combination. Thanks alot for the kind words, Janet. I understand about tired :- ) Much nicer to bake when the energy is there. I just took the photos of the date/oatmeal loaf and will post here rather than on your other blog. 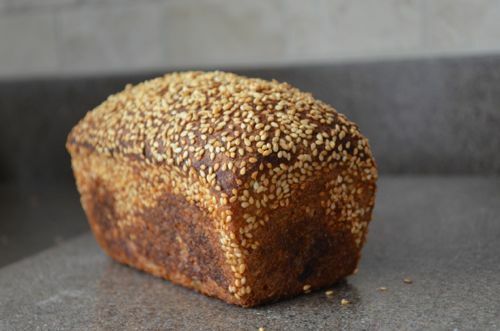 The sesame seeds really looked pretty after the bake. I was worried they would all blow off in my little convection oven but that didn't happen. My daughter said it tasted great so I will do it again sometime. Crumb was nice and moist but firmer than a 'normal' sandwich loaf which I think is due to the dates and the oatmeal which is added as dry flakes. Thanks for this inspiration for this loaf! My daughter said it tasted very nice. Not too sweet but the dates do add that nice sweetness and combined with the oats give it a firm but soft texture. She liked the addition of the sesame seeds too so I will continue to add them and now I want to include them in other breads because I did like how they looked on this loaf. I remember as a child really liking them on crusts of one of the breads my mother used to buy for us. The crust was the first part of the bread I would always eat. Again, thanks for your supportive words. I really appreciate them! loaf of Oat, Date and Sesame bread - just beautiful Janet. You should post it on the recipe section of TFL for the rest of us to make! bread Khalid - very healthy. Looks very soft! When i want softer crust, I just baste it in NF milk when it comes out fo the oven :-) I would like to see your recipe for the WW bread too. We are going to do another multigrain one this Friday at 100% hydration.and 100% whole grains - with a scad and ground sesame and flax - probably.Thang Zhong would make it too wet i'm guessing. The baguettes are beautiful too. Brushing the crust with milk is another way to a softer crust, i believe. I also believe that my initial low baking temperature has contributed to the softness of the crust. however, i'm still new to the Tang Zhong world, and i'll have to try it with a lower hydration dough next. As to the recipe, i'll will pm it to you. 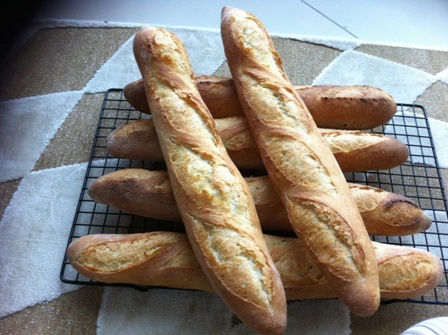 Great looking baguettes! Wonderfully looking Tang-Zhong Whole Wheat Multigrain! Would you mind sharing the formula/method for the Tang-Zhong WW Multigrain, already including the adaptations you deemed necessary (like lower hydration)? I will pm the recipe formula to you. I'll be eagerly awaiting its arrival! You mention lowering the hydration to a reasonable level for the next bake. Did you use more water in this bake than you normally do? If so, was that because of additional water from the water roux? You certainly seem to have compensated effectively, based on the outcome. The baguettes are lovely, too. Yes, the water roux brought additional moisture in addition to the sunflower seeds' not soaking the boiling water. What i meant by lowering the hydration was adding more flour, that and using a grain instead of sunflower seeds. I've been trying on a few bakes with baguettes. I guess I need to practice more often on baguettes in the future. Can you share your formulas for those loaves in the photos? Sure, i'll pm you the formulas. Those are beautiful loaves. Would you mind sharing your WW Tang Zhong recipe? I'll pm you the recipe. You really make some very interesting tinned loaves. Inspirational. I love to bake hearth breads, but my bread recipients (my parents) favor softer crusts. I want to try the recipe above as a free standing hearth bread, brush it with milk or butter when it comes out of the oven, and wrap it with a plastic bag to soften. thanks for the kind words, Phil! Beautiful baguettes there! You have some good ideas there for a softer crust, namely: "brush it with milk or butter when it comes out of the oven, and wrap it with a plastic bag to soften." Add to that list: bake at at a lower temperature or for a shorter time. Well, not to that extent! afterall ,hearth breads' appeal has alaways been in crust color and shape. Hmm.. I'll have try your suggestion, and see for myself. Those breads are simply beautiful......would it be possible to get your receipes for the breads baked? Thanks so much. I suppose you can convert any regular yeasted bread recipes using this method? I understand that the ratio of water to flour is always 5:1 so if I just take a small amt of flour, say 3 or 4 % instead of 5% from the total amt of flour, and also taking into consideration the total amt of water used in the recipe (may need to add back a little bit more water in the final dough) since a small percentage is lost due to evaporation when cooking the water roux.? May I ask what is the percentage of your multigrains that you used and the % of wholewheat to bread flour? If the dough is too wet, perhaps there is no need to soak the seeds overnite, or perhaps just for a couple of hrs instead? Thanks Khalid. Yes, that is about right. I don't think you'd need to add water to compensate for the evaporated water in the tangzhong, as it brings enough moisture to the dough and adding water will make it too wet. The recipe's baker's percentage can be calculated from Txfarmer's post on the recipe here. As to reducing the soaking time, that may impact the hardness of the grains and increase the wetness of the dough, as the soaker had no sufficient time to soak. of did you use a levain for the WW multigrain loaf? I saw Txfarmer 's recipe and she uses a levain. I'm wondering if whether you used a levain plus part of the final dough for water roux? Many thanks. I used both, a levain and a tsp of instant yeast for the final dough. i did use part of the recipe water for the roux. Thanks. I've sent you the recipe. It's a testament to the popularity of your post that this thread has been running almost a year - congratulations on that and on your bread!! I've been mostly a white-flour (occasionally rye, too) baker for many years, but my wife and I are trying to shift more of the processed ingredients out of our diet and I think your bread would definitely be a step in the right direction. May I please have the recipe? Thanks for the nice words. I've sent you the recipe.